Last week, loud thunderstorms rumbled through town for over twelve hours. For me, this was a treat; it's rare to hear thunder or see lightning in Seattle. As my house rattled and the lights flickered on and off, as winds sent my rooster weather vane spinning, and heavy rains (and hail!) pounded the roof and bricks, I laid in bed with my cat Vanya Mandelstam and thought of the old days in Virginia when, as a little boy, I'd enjoy a good electric storm from the safety of a shed at my Aunt Lois's house. Her home was next to fields and woods and in summer I had a good view as lightning flashed through hay or corn or pine trees. It was a sensational experience. As the storm strengthened, I would feel physically elated, jolted to life, as if I had just put a whole lemon in my mouth and bit down — my tongue would tingle, my throat would constrict; a flash of bitterness would travel through the roof of my mouth into my brain and I'd feel as if I had been scalped...the top of my head became numb. When I described these feelings to a friend, she said: "Are you sure you weren't struck by lightning?" I don't think so, but the shed DID have a tin roof. As I wear Oriza L. Legrand Foin Fraîchement Coupé1 ("freshly cut hay"), I think of the aftermath of summer storms, when the skies become quiet and the sun comes out and dries and warms the crowded fields (with their cultivated crops, pungent weeds and stragglers from the garden — usually poppies and cornflowers at my aunt's house). Foin Fraîchement Coupé does not possess a clean, raindrop-soaked, lightning-strike clarity; it is the mellow recuperation after my scalp-slapping, tongue-curling storm. Foin Fraîchement Coupé's notes have a gold tone, and seem embedded in powder one minute, and glazed in amber resin the next. The perfume's opening is minty-herbal; the mint is not wild and fuzzy, but talc-y, the angelica is dense and chewy, not sharp, sage is — aged. 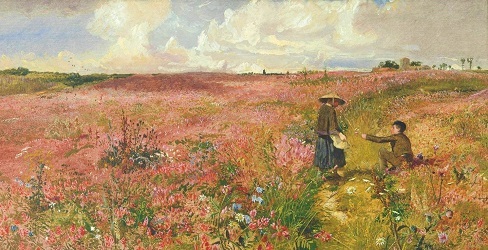 Foin Fraîchement Coupé's heart and base smell of hay and sainfoin notes2 — nothing freshly cut, but plants that have been cured in the sunshine. Now, if a perfumer could create a true storm in a bottle for me, I'd be set! Oriza L. Legrand Foin Fraîchement Coupé Eau de Parfum is $125 for 100 ml. For buying information, see Oriza L. Legrand under Perfume Houses. 1. Listed notes ingredients of angelica, star anise, wild mint, clover, sainfoin, new-mown hay, clary sage, dry hay, white musk, cockle and ivy. 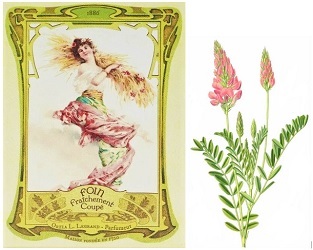 Note: top image Study for Saintfoin in Bloom by John Samuel Raven and middle image of sainfoin (Onobrychis satvia) via Wikimedia Commons. I love the idea of Oriza L. Legrand perfumes more than any of the actual perfumes I have sniffed. Meredifay…they, at least some of them, have an old fashioned air about them which some people don’t like. (I do.) They are dense fragrances, too…I have to be in the mood! I’m still chuckling! You made my day. Good review; this one sounds interesting. Rappleyea…I have been shocked by electrical current many times…but don’t think by lightning! It’s the only Oriza L.Legrand that I have a full bottle of. I love the line, I think I have tried about half of it. I really enjoyed your review, although I must admit to always having been rather weary of thunderstorms myself. Which of the Oriza’s is your favourite? Austenfan…I think Chypre Mousse is my favorite…but really want to try the Vetiver. I’ve got a sample of the vetiver and I would love to try Chypre Mousse. Please do try the Vetiver and let us know what you think! It is my favorite of the line so far. Your recollection of that thunderstorm was so vivid I was expecting something similarly strong in Foin Fraîchement Coupé! Love the review, it seems like a lovely relaxing perfume. Hopefully someone will manage to bottle a thunderstorm scent, I’d love to try that! Hemabelle…a thunderstorm perfume is needed…who is the best perfumer for the job? Demeter (Library of Fragrance in the UK) sells a scent called “Thunderstorm.” I’ve never tried it. OK, Kevin, you are convincing me to give this line a chance. BTW, have you tried Iunx Splash Forte? I sampled it today and found that combination of red cedar, bay rum, peppermint and bird’s eye chilli simply exciting. And it has an unusual cedar-red color.